It is a common misconception that you should toss all of your old furniture and accessories to make room for all of your new pieces. We are asking you RIGHT NOW to STOP thinking that way and embrace the old pieces you have grown to love! The fastest way to have a boring design is to stick with a specific style or time period. A well design space showcases its owner’s personality and embraces pieces that spark conversation. Do you have an antique chest that has been passed down from generation to generation? KEEP IT! It will contrast your new furniture and add texture, history, and personality. Gone are the days that we have to stick with one time period (i.e. Art Deco, Art Nouveau, and Shaker). This innovative design concept is called Eclectic. Eclectic literally means, “deriving ideas, style, or taste from a broad and diverse range of sources.” Here are some examples of eclectic spaces that have a perfect balance of old and new, and embrace it’s owners history and personal style. 1. 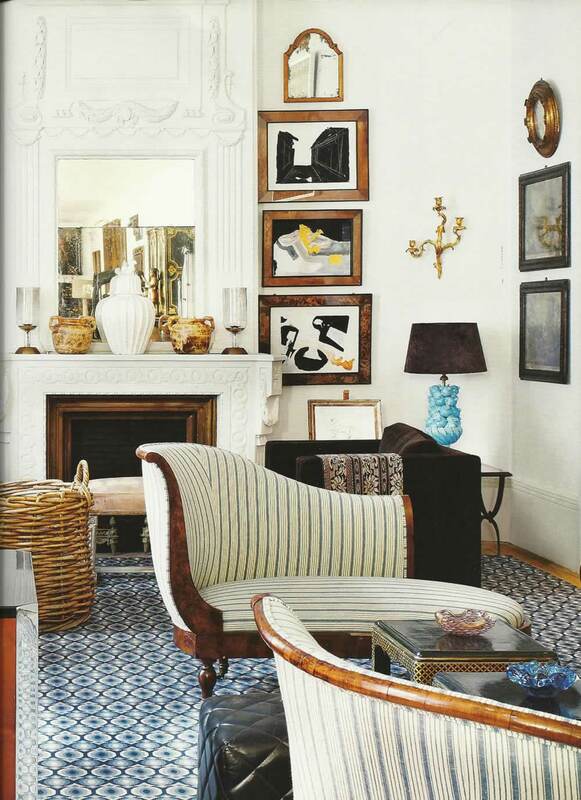 Interior Designer Mariette Gomez’s home. Using a crisp white paint on the walls lends itself to the perfect canvas to house your collection of art and “off” pieces. As shown in this image, Mariette mixes her traditional antiques with fun and contemporary items that she has curated over the years. She stays away from trendy fabrics or styles and keeps items that truly make her happy. 2. A spanish home that embraces old and new. This space, again, keeps a simple white wall to showcase the eclectic mix of artwork and accessories with traditional lounges to keep it classic. 3. Orlando Soria’s dining room. This space mixes a danish style chair, transitional rug, traditional art, midcentury table, and contemporary pendant lamps to create a space that is truly unique. Chairs and rug available to order at Turner’s Fine Furniture! Our best advice when it comes to mixing old and new pieces, would be to hunt your space, keep what you love, and be fearless in your decisions. If it reflects your personality, it will be beautiful! Trying hard to fit a trendy style that you don’t necessarily love will end up feeling disconnected and impersonal. We hope this advice will help you with your next #DesignDelimma! Contact us below or on our Facebook if you have your own problem to solve. We would love to hear from you! This entry was posted in Uncategorized on April 16, 2016 by Staci Wright.